We design, install and replace outdoor decks in Columbus and all surrounding cities. Our crew builds custom decks in any size and layout you can imagine. We use only the highest quality materials for maximum durability. Outdoor decks are the perfect spot to enjoy your yard with friends and family. Contact us today to schedule a free on-site consultation and let’s start designing your new deck. Make the most of your backyard today! Deck replacement and installation are just two of our exceptional exterior services. 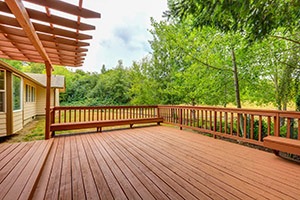 If your wood deck has seen better times, don’t fret, just give us a call, and we will work with you to design a replacement that we know you’ll love. Our deck building crew have transformed hundreds of backyards in the area, and they can do the same for your property. The wood we select is pressure treated, and we use galvanized nails that are long-lasting. We work skillfully and quickly to finish your new deck. We make sure to keep you up-to-date on our progress throughout the job. Our focus is on personalized attention at an affordable price; we promise you won’t be disappointed.  Call us today to learn more about any of our home exterior services, including all season rooms, patios, and porches. If your backyard leaves a little to be desired, we can change that for you. Our crew will take into account your needs and the layout of your yard before designing the perfect outdoor deck for your home. Once you’ve settled on the design, we will take care of the necessary permits and get right to work. In no time at all, you will be kicking back and enjoying your backyard like never before! Our goal is your total satisfaction, and we want you to love the finished product. Reach out to us today, and we will start your backyard transformation with a custom wood deck! Picture yourself relaxing on your new wood deck with a good book, or enjoying a meal outside surrounded by friends and family. We can make your dreams a reality with our custom design and installation services. Whether you are looking for a multi-level deck or simply ground level, we will work with you to fine tune the perfect design. Let us put our skill and expertise to work for you by installing a brand new wood deck in your yard. Working with a licensed and experienced contractor is the best way to make sure your new deck stands the test of time. Call us today for a free estimate and onsite consultation. 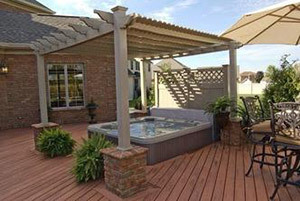 We will show you photos of our previous custom built decks to help spark some ideas for your yard. We install outdoor decks in Columbus, Dublin, Westerville, Worthington, St Clairsville, and surrounding areas in Ohio.